This list assumes without stating that anyone watching a sports film realizes that a certain amount of violence and/or blood may appear. 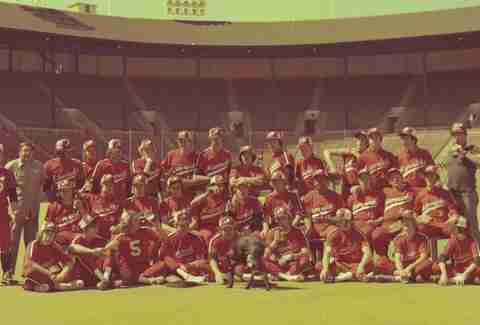 Kurt Russell, who interrupted his acting career to play baseball professionally in the 1970s, is one of the highlights of this documentary about his father’s legendary minor league team, the Portland Mavericks. But he’s just one piece of a highly entertaining true story that chronicles the independent baseball club and its ragtag team of rejects, who seem more tailor-made for an underdog sports comedy than reality — no surprise, there’s a Hollywood remake in the works. 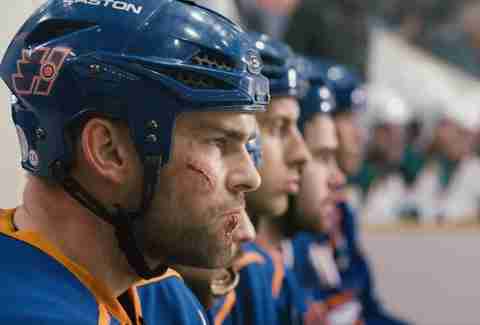 David O. Russell’s (Silver Linings Playbook, American Hustle) The Fighter packs a punch. The Oscar-nominated biographical drama stars Mark Wahlberg as underdog boxer Micky Ward alongside Christian Bale, in yet another transformative role as Ward’s older half-brother/trainer Dicky Eklund. Lined with action and grit, the film follows Ward’s unpredictable rise in the ranks in the world of championship welterweight boxing with the contested help of his washed up brother who descended into drug addiction and a life of seedy crime. Tethered to his success is the strength of the destructive closeness of his family, including his mother played by Melissa Leo, and the relationships outside of it, like that of his girlfriend played by a scene-stealing Amy Adams — meaning The Fighter is a hard knocks lesson in what it means to look out for someone, as well as a masterclass in acting. Now that Netflix has its own fictionalized series about the short-lived women’s professional wrestling league and television show in the late 1980s, GLOW has achieved more widespread recognition. But the 2012 documentary look at the league has everything you could want in a sports movie: inspiration, humor, tragedy, heartbreak, redemption, and the feeling that you could never, ever do what they did. Adam Sandler has returned to the dude-friendly, cliche-filled sports movie well over the years, but this slobs vs. snobs comedy about a hockey player-turned-golf pro earns its gold jacket. 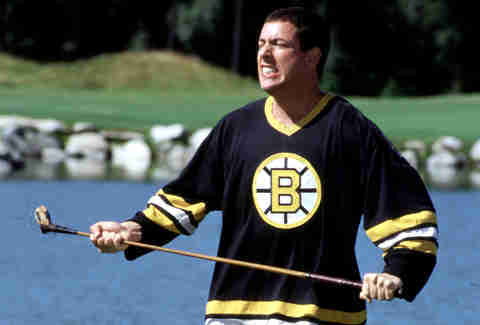 In the ridiculous flick, Sandler plays a wannabe hockey player who isn’t quite a slap shot on the ice, so he decides to take what skills he does have to the driving range and the PGA tour in order to make money to save his grandmother’s house. Two decades of people incessantly quoting the movie out on the links still can’t zap this thing of its long-drive-hitting, magical power. Even if you can’t stand Sandler, it’s worth a watch. High Flying Bird is a basketball film that has little to do with the sport itself, instead focusing on the behind-the-scenes power dynamics playing out during a lockout. 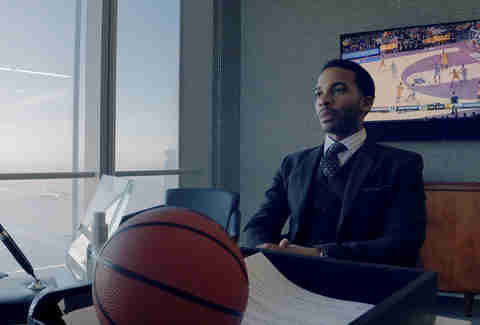 At the center of the Steven Soderbergh movie — shot on an iPhone, because that’s what he does now — is André Holland’s Ray Burke, a sports agent trying to protect his client’s interests while also disrupting a corrupt system. It’s not an easy tightrope to walk, and, as you might expect, the conditions of the labor stoppage constantly change the playing field. With his iPhone mirroring the NBA’s social media-heavy culture, and appearances from actual NBA stars lending the narrative heft, Soderbergh experiments with Netflix’s carte blanche and produces a unique film that adds to the streaming service’s growing list of critical hits. Fascinated by doping scandals and Lance Armstrong’s fall from grace, Brian Fogel, a playwright and amateur cyclist, fell deeper into the chemical trend than he could have possibly imagined after connecting with Dr. Grigory Rodchenkov, who would reveal himself to be the director of the Russian laboratory in charge of aiding Olympic athletes. Icarus traces a line through a history of doping and Rodchenkov’s whistleblowing, which ignited fury in Russia and turned him into a political target. Fogel’s film is the rare science-minded doc that also plays like a Tom Clancy thriller. Like everything else, sports were elevated to another level of competition during the Cold War, and the Olympics were like the final showdown between the U.S. and the Soviet Union in the percolating nuclear fallout. The 1980 Olympic hockey tournament between the favored-to-win, four-time gold medalists Soviets and America’s hodgepodge team was no different. 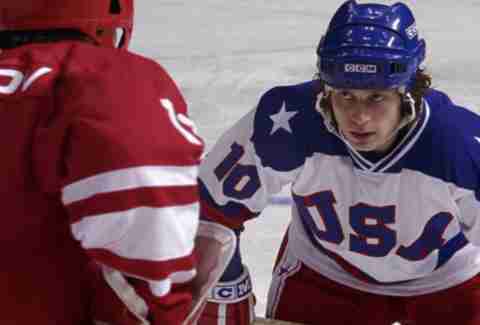 The real-life underdog story is documented in 2004’s Miracle, chronicling the Americans’ preparation for the games, lead by the unorthodox, inspired coaching of college hockey coach Herb Brooks (Kurt Russell), culminating in the “Miracle on Ice” during the semi-final match. 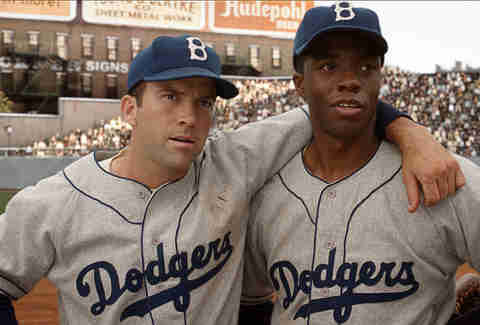 Miracle is a remarkable, triumphant look at one team’s determination in a particularly contested period in history. 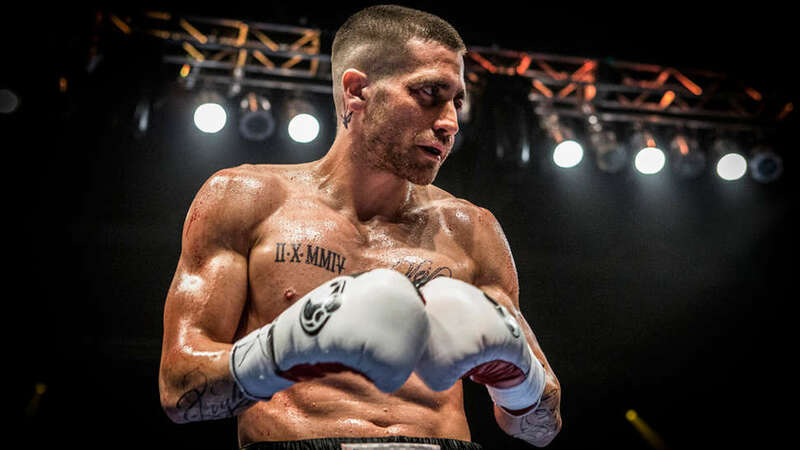 In this brutal boxing film, Jake Gyllenhaal plays undefeated champion Billy “The Great” Hope who finds his life plagued with tragedy, forcing himself to go back into the ring in order to get his life back on track. After the accidental death of his wife at the hands of another boxer who provokes Billy for a match, then suffers a breakdown and loses custody of his daughter, he’s determined to win back what matters most to him — meaning another fight is inevitable. Even in its darkest moments, Gyllenhaal carries the champion revenge tale with a knockout performance. You may have heard of Lance Armstrong — he was the cancer survivor who won seven Tour de France races in a row, and was a god among American athletes. 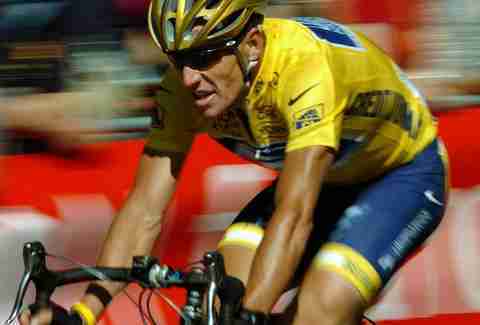 This documentary traces his rise from a poor Texas background to the most dominant competitor in his sport, and uses his own words during investigations into his alleged drug use to show Armstrong’s nasty, deceptive side. It’s difficult to describe the shock and depth of Armstrong’s fall to anyone who didn’t experience it in real time, but this documentary pulls no punches in exposing Lance and the doping culture of professional cycling. In the ’80s, millionaire John du Pont was determined to help the USA Olympic Wrestling Team come home with the gold. He pumped funds into the team and even convinced world-class wrestlers Mark and Dave Schultz to join what he called “Team Foxcatcher” and live on his expansive property, which featured its own state-of-the-art training facility. In the Netflix original doc Team Foxcatcher, director Jon Greenhalgh chronicles this eccentric story, primarily through the life of Dave Schultz, and how his association with du Pont eventually cost him his life. This unsettling film features rare, original home footage that adds a chilling depth to the story told in the 2014 film Foxcatcher, starring Steve Carrell, Channing Tatum, and Mark Ruffalo as Dave Schultz. 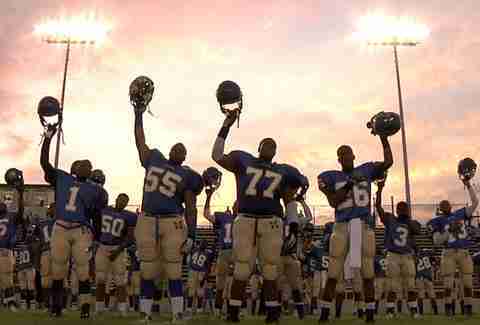 Winner of the Academy Award for Best Documentary Feature, Undefeated tells the remarkable story of Memphis, Tennessee’s Manassas Tigers, who have a storied tradition of losing. When a new coach turns the program around and the team is on the verge of actually winning something, the tension builds as everyone wonders: Do they actually have what it takes? “Now that’s what I call high-quality H2O.” With those words, a thousand GIFswere born, but before the internet turned Bobby Boucher into a meme, he was just a goofy movie character partially based on “The Excited Southerner” from Adam Sandler’s early comedy album. Boucher is one of Sandler’s most iconic creations — part innocent simpleton, part raging psychopath — and this was his first massive hit, grossing over $185 million worldwide, but the film surrounding him isn’t quite as memorable as the catchphrases. It’s the type of movie that’s more fun to quote than actually watch. 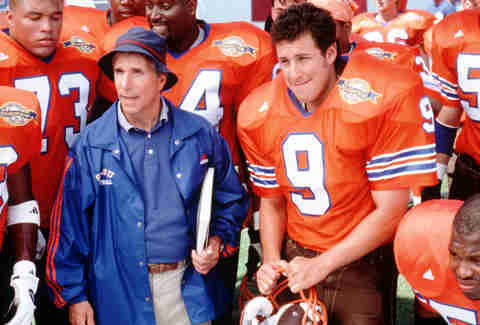 Of course, that doesn’t matter to superfans like Kanye West: they’re too busy going Bobby Boucher to care. Jackie Robinson is a true American hero: He singlehandedly desegregated the nation’s pastime, enduring with dignity the attendant abuse along the way, and continued to be an advocate for justice after his playing career finished. This biopic is mostly straightforward and conventional fare, but Robinson’s story is so inspirational that it’s worth a watch when you need to a reminder that some people can be heroes after all. Sign up here for our daily Thrillist email, get Streamail for more entertainment, andsubscribe here for our YouTube channel to get your fix of the best in food/drink/fun.